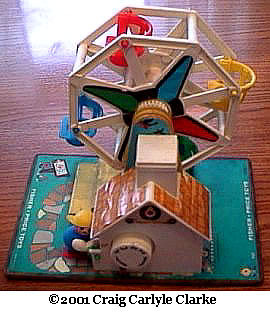 Description: The Ferris Wheel is the very first Little People set that featured a wind-up music box and a ride that spins by itself. This would prove to be a good idea, as a similar concept was adopted for 1972-1977's #111 Merry-Go-Round, and again for 1981-1983's #170 Change-A-Tune Carousel. The most hard to find accessory in this set is the dog with droopy ears. This dog is nearly identical to the dog used in the #932 Amusement Park and the #719 Fisher-Price Choo-Choo, except the dog used in this set has a slightly taller body. The shorter dog used in the #932 and #719 doesn't really fit well into the Ferris Wheel seats. When originally introduced, the Ferris Wheels was sold with Straight-Sided Little People figures. The ferris wheel seats had an upright PEG in the center to hold the Straight-Sided figures in place (seat peg fits within hole in bottom of figures). NOTE: Regular-Base figures do NOT fit properly in peg seats. In the early 1970's, the figures were upgraded to Regular-Base figures and the now unnecessary pegs were removed from the ferris wheel seats. Both Straight-Sided and Regular-Base figures CAN fit into the seats without a peg. Besides for seats with peg vs. seats without a peg, the Ferris Wheel base variations are based on the colors of the attached mad boy who turns the crank. Originally, the boy's head was made of wood, later models used a plastic head. The colors of the boys' body and baseball cap can be any mixture of blue, green, red, and yellow. B969C - Ferris Wheel with a masonite (wood) base. The base has 2 yellow wooden upright posts that hold a round white wheel. The wheel has 4 seats (blue, green, red, and yellow) with a round peg within each seat. The mad boy who turns the crank has a green body, white plastic arms, a wooden head with freckles and "" eyebrows, and a red sideways baseball cap. GKWW - Red girl with fancy eyes, a red bow and hair heat-stamped on top of her head. QWW - Light blue boy, smiling, red heat-stamped hair. BRWW - Green boy, smiling, freckles, and '''" eyebrows. JVWW - Black dog with a black face, pointed nose, and white droopy ears. B969A - Ferris Wheel with a masonite (wood) base. The base has 2 yellow wooden upright posts that hold a round white wheel. The wheel has 4 seats (blue, green, red, and yellow) with a round peg within each seat. The mad boy who turns the crank has a blue body, white plastic arms, a wooden head with freckles and "" eyebrows, and a yellow sideways baseball cap. BBWW - Dark blue boy, smiling, red heat-stamped hair. B969D - Ferris Wheel with a masonite (wood) base. The base has 2 yellow wooden upright posts that hold a round white wheel. The wheel has 4 seats (blue, green, red, and yellow) with a round peg within each seat. The mad boy who turns the crank has a red body, white plastic arms, a wooden head with freckles and "" eyebrows, and a green sideways baseball cap. JFWW - Black dog with a black face, pointed nose, and yellow droopy ears. B969G - Ferris Wheel with a masonite (wood) base. The base has 2 yellow wooden upright posts that hold a round white wheel. The wheel has 4 seats (blue, green, red, and yellow) with a round peg within each seat. The mad boy who turns the crank has a blue body, white plastic arms, a wooden head with freckles and "" eyebrows, and a red sideways baseball cap. B969B - Ferris Wheel with a masonite (wood) base. The base has 2 yellow wooden upright posts that hold a round white wheel. The wheel has 4 seats (blue, green, red, and yellow) without a peg in each seat. The mad boy who turns the crank has a blue body, white plastic arms, a plastic head with freckles and "" eyebrows, and a yellow sideways baseball cap. FHWP - Blue girl with red braids. CCWP - Green African-American boy with a red cowboy hat. HYWP - Black regular base dog with a yellow collar. The collar has "lines" on the outside edges. B969F - Ferris Wheel with a masonite (wood) base. The base has 2 yellow wooden upright posts that hold a round white wheel. The wheel has 4 seats (blue, green, red, and yellow) without a peg in each seat. The mad boy who turns the crank has a red body, white plastic arms, a plastic head with freckles and "" eyebrows, and a green sideways baseball cap. Measures 9-1/4" long, 6-5/8" wide, and 8-3/8" tall. FOWP - Blue girl with fancy eyes and a red ponytail. KVWP - Green African-American boy with black heat-stamped hair. B969B - Ferris Wheel with a masonite (wood) base. The base has 2 yellow wooden upright posts that hold a round white wheel. The wheel has 4 seats (blue, green, red, and yellow) without a peg in each seat. The mad boy who turns the crank has a blue body, white plastic arms, a plastic head with freckles and "" eyebrows, and a yellow sideways baseball cap. Measures 9-1/4" long, 6-5/8" wide, and 8-3/8" tall. FOWP or FOPP - Blue girl with fancy eyes and a red ponytail. KVWP or KVPP - Green African-American boy with black heat-stamped hair. HYWP or HYPP - Black regular base dog with a yellow collar. The collar has "lines" on the outside edges. FOPP - Blue girl with fancy eyes and a red ponytail. GMPP - Red girl with a blonde bob with bangs. KVPP - Green African-American boy with black heat-stamped hair. HWPP - Black regular base dog with a red collar. The collar has "lines" on the outside edges. B969F - Ferris Wheel with a masonite (wood) base. The base has 2 yellow wooden upright posts that hold a round white wheel. The wheel has 4 seats (blue, green, red, and yellow) without a peg in each seat. The mad boy who turns the crank has a red body, white plastic arms, a plastic head with freckles and "" eyebrows, and a green sideways baseball cap. B969E - Ferris Wheel with a masonite (wood) base. The base has 2 yellow wooden upright posts that hold a round white wheel. The wheel has 4 seats (blue, green, red, and yellow) without a peg in each seat. The mad boy who turns the crank has a green body, white plastic arms, a plastic head with freckles and "" eyebrows, and a red sideways baseball cap. B969A - Blue body madboy with a wooden head and a yellow side-ways baseball cap. B969C - Green body madboy with a wooden head and a red side-ways baseball cap. B969D - Red body madboy with a wooden head and a green side-ways baseball cap. B969G - Yellow body madboy with a wooden head and a blue side-ways baseball cap. B969Ap - Blue body madboy with a wooden head and a yellow side-ways baseball cap. B969Cp - Green body madboy with a wooden head and a red side-ways baseball cap. B969Dp - Red body madboy with a wooden head and a green side-ways baseball cap. B969Gp - Yellow body madboy with a wooden head and a blue side-ways baseball cap. B969B - Blue body madboy with a plastic head and a yellow side-ways baseball cap. B969E - Green body madboy with a plastic head and a red side-ways baseball cap. B969F - Red body madboy with a plastic head and a green side-ways baseball cap. B969H - Yellow body madboy with a plastic head and a blue side-ways baseball cap. Retail price in the 1971 J.C. Penneys Spring and Summer Catalogue was $5.66.